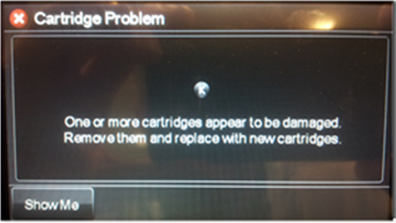 If you see a Cartridge Problem error message when you are using non-HP cartridges, it is possible that a dynamic security feature has caused the printer to reject the non-HP cartridge. It is also possible that the cartridge has simply failed for other reasons. Your printer is in the table at the top of this document. Other HP printers are not affected. You are using an aftermarket supply that contains a non-HP security chip (this may be a refilled or remanufactured HP cartridge with a non-HP chip). Only cartridges that lack HP’s security chip are affected. A Cartridge Problem error message displays. Other error messages are not related. HP has a firmware update that removes the dynamic security feature. The update is available only for the printers in the table in this document, because only those printers are affected. Do not use or power off the printer or computer while the firmware update is in process. Make sure the printer is on and connected to the computer, either through your network or a USB cable. Click the link for your HP printer model in the following table and run the downloaded firmware update file from your Internet browser. 3. Look in the HP Printer Update window to see if your printer serial number displays. If the serial number is listed, select the printer serial number, and then click Update. If the serial number is listed but status is not applicable (grayed out), the firmware does not need to be updated. Click Cancel. If the serial number is not listed and your printer is using a network connection, connect a USB cable, wait 20 seconds, and then click Refresh. 4. When the update is finished, click OK.
5. If you connected a USB cable for your networked printer, then remove the USB driver that was added by Windows. Search Windows for Devices and Printers, and then open Device and Printers from the search results. Right-click the USB printer device that matches your printer model, and then select Remove Device. Disconnect the USB cable, and restart the computer. 6. If the cartridge still fails after the feature is removed, then the cartridge is most likely defective and should be returned to your retailer.